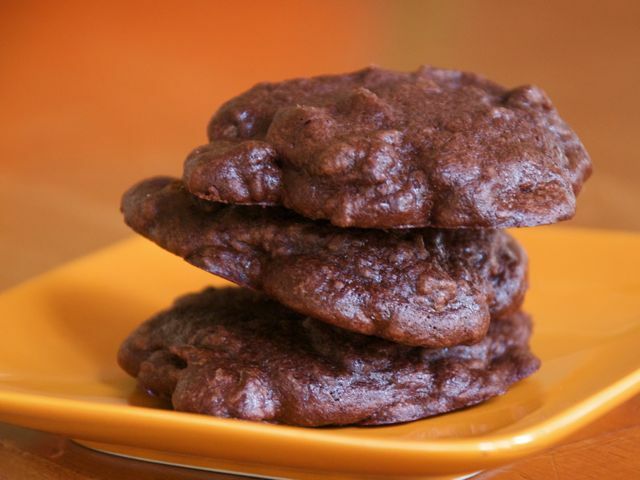 This is the perfect chocolate cookie — creamy and moist with a brownielike texture. It is a batter rather than a dough cookie. The batter must chill in the refrigerator for at least an hour before baking. Melt the unsweetened chocolate with the butter in a heavy-bottomed saucepan over very low heat. Mix together the flour, baking powder, and salt. In a mixing bowl, beat the eggs, then add the sugar, and continue beating until light and well blended. Add the chocolate mixture to the egg mixture and beat well. Add the flour mixture and mix until well blended. Stir in the chocolate chips. Chill the mixture in the refrigerator for at least 1 hour. Preheat the oven to 350 degrees. Grease a cookie sheet. Drop by teaspoonfuls onto the cookie sheet and bake for 5 to 6 minutes. Do not overbake; these cookies are best if slightly underbaked. Remove to a rack to cool.